An appraisal objective this year was to learn more about digital marketing to better understand and improve the Virtual Library and Knowledge Service (VLKS) marketing effort. The aim was to complete a MOOC (Massive Open Online Course) on digital marketing. The MOOC chosen was Marketing in a Digital World from the University of Illinois delivered by Coursera. For colleagues who haven’t already taken a MOOC on Coursera, courses are free. You get a certificate saying you have completed the course, useful for CPD / appraisal. You can pay for a validated certificate which has more information about you and contributes credits to courses made up of linked units which Coursera calls a specialization. Other brands of MOOC are available! The following is a selective reflection on the course and on marketing the VLKS. Trying to fit what is essentially a commercial model to a public service environment. It’s not a review of the whole course or a summary of the contents. Go to Coursera for that. The model for the consumers decision to buy has changed. The linear funnel model consumers narrowing down searches from initial impulse to search to actual purchase is out. 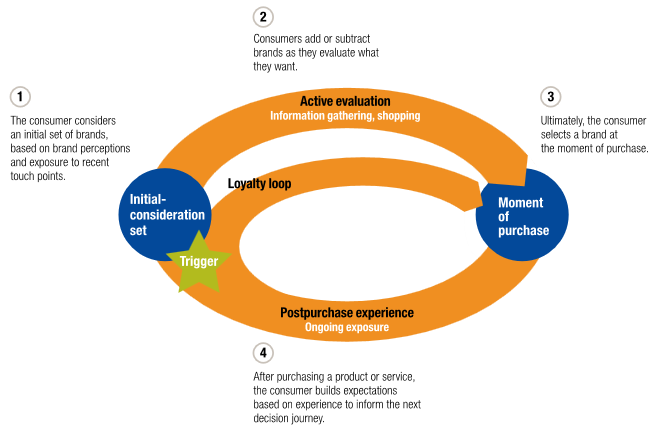 In is the consumer decision journey (CDJ) is in. CDJ is an Iterative model that incorporates aspects of social media. Here are a few other useful ideas to throw into the mix. Digital Touch Points – points of interaction between consumers and services. The short version is the more touch points you have the more likely the consumer is to buy your brand. The successful brands in the digital marketplace are very good at this. Multi Channel Marketing – the capability to interact with your consumers across different media, this would include digital and physical/retail space. Post Purchase Experience – consumers share their experience of buying / consuming the brand with others through social media e.g product reviews. These are the customers who become loyal customers as they invest time and effort in sharing their experiences through digital media, typically reviewing a product or posting a comment about their purchase experience on social media. Authenticity – The degree of synchronicity between you brand values and the actions associated with your brand. For example claiming environmental awareness but manufacturing in an exploitative or environmentally damaging way. Consumers are good at seeing “inauthenticity” and spreading that through social media. Co-Creation – The process by which customers share in the creation of your product, in a range from product suggestion to crowdsourcing the design of components. Consumers behaviours are changing too. Consumers move seamlessly between digital and physical spaces depending on preference, context and task. The old analogy of digital immigrants / digital natives looks tired now. Many customers are born digital, the rest are adapting fast. Digital is now “normal”. library “products” are born digital (journals, books, software, reference and much more) or can be delivered digitally as well as face-to-face (advice, enquiries and training). Being Digital, excuse the pun, gives libraries an advantage in adopting the lessons of digital marketing. What aspects of NWAS LKS Marketing Plan be different or new if it were written with digital marketing in mind? The three year NWAS LKS marketing plan was in fact written last year, but is subject to an annual review. The idea of journeying through the libraries services is interesting. Simplifying the consumer decision journey is a key strategy for successful digital marketing. Health care libraries are encouraged to offer a core set of services (draft), however, this is from the point of view of What we offer … rather than a user journey perspective or What do you want to do today … ? Just asking this question raises challenging design issues. Services statements, web links and websites offer services but do they offer solutions to our users? I am guessing no. The NWAS LKS website is in the services offered not solutions genre. A rethink of library processes / website from the users perspective would go into my Marketing Plan. You have to meet your users where they are. If they are using social media then your health care library has to be in the mix too. This is (yet) another good argument for having a coherent and planned approach to social media. In a one person service, this is a struggle. Add a new channel and you add more work. An analysis of the best social media to use and looking at ways to integrate into overall library communications strategy would be a marketing objective. Content is still king of the web. This is the lesson of successful digital marketing campaigns. Looked at from the point of view of digital marketing, writing good content for other people to use, or reuse, is the best way of selling your service. Remember to link back to your website and make your moniker unmissable. At least part of the role of the healthcare librarian is giving information, putting your journalist hat on and packaging it up for other people to use is just the next step. I would include an objective to look for opportunities to place content on websites and newsletters. A definition of quality is we say what we do and we do what we say. That could also be a definition of authenticity. Lack of authenticity is the dissonance between a claimed characteristic, feature or value and an underperforming or contradictory reality. It’s hard for a health care library to be inauthentic, but not impossible. Welcoming and easy to use but a website from hell and hard to find physical space. I don’t think this represents any service that I know, but I would check that the claimed values of the library match reality in any marketing I did. How do you use your users post experience feedback to sell library services to non-users – closing the CDJ loop? Traditional means of gaining user experience data usually fail. Did someone say survey! However, a lively social media presence can draw users in to share experiences as part of the normal interactions with the libraries. Looking at innovative ways to encourage or solicit post experience feedback, avoiding Library MacLibraryFace, would be in my new Marketing Plan. This entry was posted in Reflection and tagged Authenticity, Co-Creation, Consumer Decision Journey, Consumer Journey, Content Marketing, Digital Marketing, Digital Touch Points, Marketing, Marketing Plan, MOOC, Multi Channel Marketing, Post Purchase Experience, Strategy, Virtual Library and Knowledge Service (VLKS). Bookmark the permalink.